In “The Causes of Hair Growth,” I hypothesized that one cause of hair growth is underused muscle, or muscle atrophy. Thus, it comes as no surprise that here I hypothesize that the cause of hair loss is muscle use, or muscle hypertrophy. 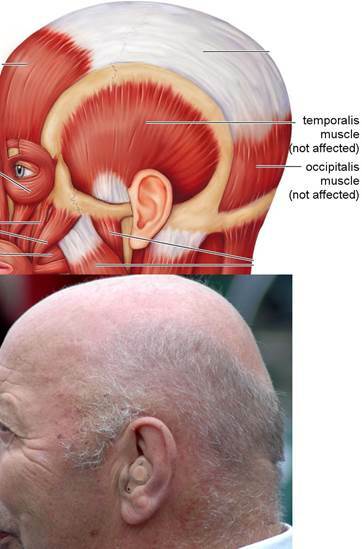 The muscles involved in balding are the frontalis and occipitalis muscles. They are responsible for raising the eyebrows (or wrinkling the forehead), which can also draw the scalp back. 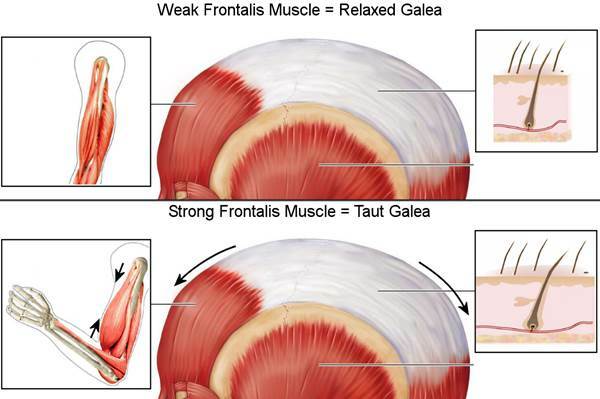 These muscles are connected together by flat tendons called the galea aponeurotica. I hypothesize that hypertrophy of the frontalis muscle and occipitalis muscle causes hair loss atop the galea aponeurotica. That is, if you raise your eyebrows (or wrinkle your forehead) with high intensity and frequency then you will go bald. Most people today only use these muscles to make the “surprised” facial expression. Some people, though, raise their eyebrows far more often and are therefore likely to go bald. Many basketball players, for example, raise their eyebrows to see the hoop when they’re under it. Many people who wear eyeglasses raise their eyebrows when they’re reading. Many old men see clearly by raising their eyebrows up to compensate for a sagging brow ridge. For some, slightly-raised eyebrows is their default, resting face. A simple way to imagine my hypothesis is that for every ~10 times you raise your eyebrows, you will lose 1 scalp hair. Only hair atop the galea aponeurotica that is affected because only this area is involved in raising the eyebrows. That is, there are muscle-tendon fibers that originate above the eyebrows and run all the way to the back of the head. 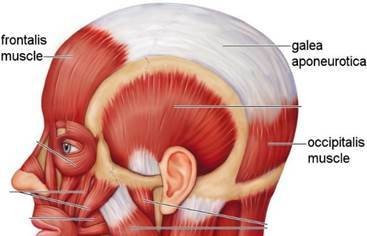 Notice how the bald man has no hair atop the galea aponeurotica yet still has hair atop the temporalis and occipitalis muscles. To understand hair growth/loss at the scalp, it helps to look at hair on the forearms and shins. This is actually where I discovered the cause of hair loss to begin with. The forearms and shins have long, flat tendons connecting a muscle to a manipulated body part, much like the scalp. At the top of the forearm, extensor muscles contract to pull—via tendons—the fingers straight. 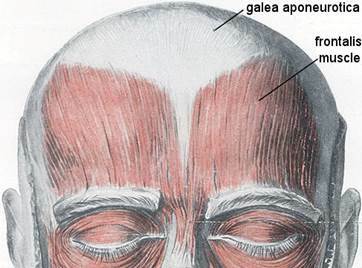 At the back of the head, the occipitalis muscle contracts to pull—via the galea aponeurotica—the eyebrows up. If you put your hand on your galea and raise your eyebrows you should feel your scalp move. Based on my balding hypothesis, extensor forearm muscle hypertrophy should cause hair loss at the area directly atop these tendons. This is hair on the lower forearm, wrist, and back of the hand. I could easily lie and say I went out and surveyed 1,000 young men with receding hairlines who, during the course of a one-minute conversation, raised their eyebrows at least once. Would that have convinced you? If you are an observant person, I beg you to check my hypothesis with your own friends and family. Think of people you know who are bald or balding: would you say they raise their eyebrows often, or can you picture them raising their eyebrows? Secondly, think of people you know (age 20 and up) who do raise their eyebrows a lot: is their hairline receding? It’s rare for someone under the age of 20 to be balding but I especially welcome these extreme cases, because these are the ones who raise their eyebrows very frequently (and intensely). To prevent hair loss, one must never get into the habit of raising the eyebrows. A fail-safe solution would be to inject Botox (or similar) into the frontalis and occipitalis muscles. This would disable the muscles’ ability to contract, so you wouldn’t even be able to raise the eyebrows if you tried. In fact, this is what scientists recently did to 50 male subjects in a study to combat hair loss. “Treatment of Male Pattern Baldness with Botulinum Toxin: A Pilot Study.” (Freund, Brian J., 2010) The study found the average subject to have an 18% increase in hair count after 11 months. The cure to balding is to cease all eyebrow-raising facial expressions. This is probably easier said than done, but Botox can really help. I hypothesize that reversal of hair loss can be accomplished by putting the frontalis and occipitalis muscles into a relaxed state. 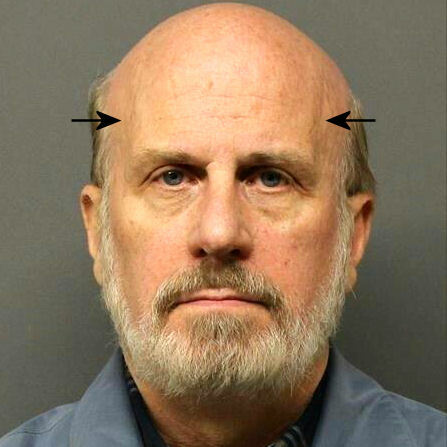 I expect that people with a receding hairline have extremely-tight frontalis muscle fibers. In most cases these taut fibers are located 1-2 inches above the arch of the eyebrow. They should be tender to touch/tap. It should take weeks to months of massage to loosen up these areas. Many people believe the cause of balding is 100% genetic and that nurture is not a factor. This usually comes from knowing a balding young man and knowing that his father is also bald. Personal anecdotes with a dash of confirmation bias. Unfortunately, for most people, this is all it takes to back a theory 100%. And when presented with an account of a young man who’s gone completely bald yet his father has not... they conveniently respond, “The balding gene must have come from his mom’s side.” If indeed there is a correlation between father and son hair loss, I can think of many alternative reasons: the tendency for a son to mimic his father’s facial expressions; the high chance of the son living a lifestyle similar to his dad’s; or, inheriting genes that produce low-set, droopy eyebrows, which interfere with vision and call for “compensatory lifting” to see clearly. Lastly, a strong frontalis muscle will lead to some degree of hairline recession. 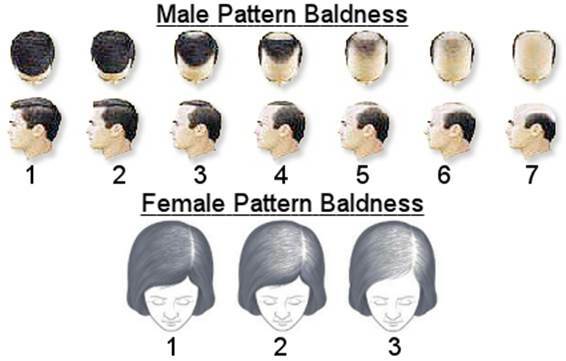 There’s male pattern baldness (MPB) and female pattern baldness (FPB). MPB is characterized by a receding hairline and an enlarging bald spot above the occipitalis muscle. This is how most men lose their hair. FPB is characterized by diffuse thinning over the top of the scalp. How do I explain this difference between men and women? Intensity. I hypothesize that raising the eyebrows with high intensity leads to frontalis and occipitalis muscle hypertrophy, which leads to MPB. I hypothesize that raising the eyebrows with high-frequency/low-intensity leads to a different, lean kind of frontalis muscle, which leads to FPB, or diffuse thinning. Now, as for why it is that women have less frontalis muscle development: many would say it’s due to a lack of testosterone; I could care less because these are specifics. The arch of the eyebrow maps to the top of the temple. 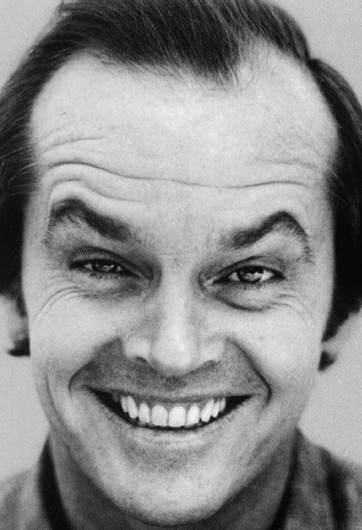 The inner corner of the eyebrow maps to the Widow’s peak. Notice the difference in how these men raise their eyebrows. The man on the left goes straight up. This uses the frontalis muscle fibers located at the arch of the eyebrow and thus produces the common receding hairline. The man on the right, however, brings his eyebrows closer together horizontally and simultaneously raises the eyebrows. 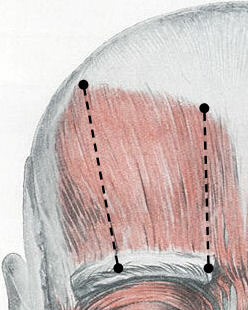 This uses the frontalis muscle fibers near the center of the forehead and thus produces “Norwood Type A.” The reason “Type A” balding is uncommon is because this manner of raising the eyebrows is uncommon. 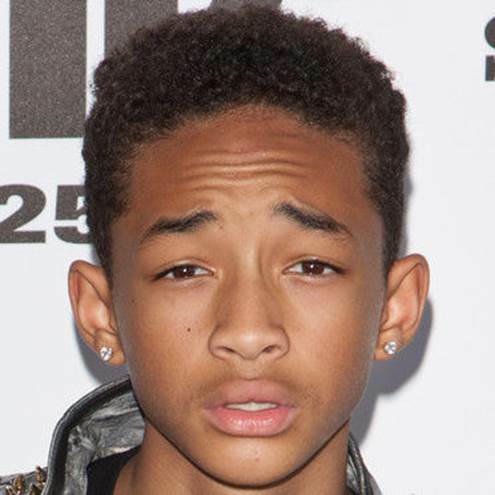 At the age of 16 (in this picture), Jaden Smith is too young to show significant signs of balding but notice his atypical hairline—a “reverse widow’s peak.” This is the result of repeatedly bringing the eyebrows closer together while simultaneously raising them. This action contracts the frontalis muscle fibers at the center of the forehead.